Here is an indicator of the progress India has made from the ancient times to the modern. A city, considered the best in terms of fortification and urban planning in those days, is now the best example of all that is wrong with urban planning of our time. 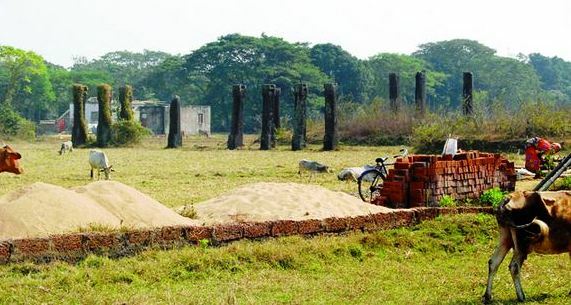 Sisupalgarh, located on the outskirts of Bhubaneswar, has fired the imagination of archaeologists world over but it has fallen prey to well-healed land sharks and government apathy. The historical site is on the verge of becoming, well, history. Writing about this city in 2008, well known archaeologist BB Lal, who excavated it first in 1948 and 1950, had this to say: “As far as I am aware, this is the best example of an early historic settlement: square on plan, measuring a kilometre each way; surrounded by a well laid-out system of fortification and a peripheral moat; eight major gateways, connected with grid-patterned streets running north-south and east-west; a palace in the centre, and much more yet to be exposed. I do feel that this site deserves to be put on the World Heritage list.” Prof RK Mohanty of Pune’s Deccan College, who along with Prof Monica Smith of University of California carried out further excavations between 2005 and 2008, says Sisupalgarh had “no comparable contemporary city in India” and was remarkable for its fortification and layout which confirmed to Kautilya’s prescription in Arthashastra. The city flourished some 2,500 years ago (approximately between 5th century BC and 4th century AD). Prof Smith says it had, at its peak, a population of at least 25,000 who lived there for nearly 1,000 years without interruptions. (Compared to this, its contemporary Athens had a population of only about 10,000, he points out.) Prof Paul Yule of University of Heidelberg (Germany), who visited the site and wrote a research paper, “Early Historic Sites in Orissa”, is effusive in his praise too. He told Governance Now in an email: “Sisupalgarh earned the distinction of being a nationally protected monument owing to its singular historic importance. It has the highest walls of any ruined fort in South Asia and is perhaps the largest, with 4.8 km of city walls. M Smith and R(K) Mohanty argue that it originated prior to the Maurya period (320-180 BCE), for which forts in India are quite rare. Few cohesive ruins of this period have survived.” The best part of Sisupalgarh is that its architectural deposits are intact and are found within the top one metre of the surface. The uppermost layers are “covered only with a thin deposit of alluvium (the Daya river, whose water is said to have turned red when emperor Ashok’s army massacred Orissa, skirts the city) and wind-borne material”, Prof Mohanty and Prof Smith write in the accounts of the excavation, “Excavations at Sisupalgarh”. On the verge of obliteration - Given the importance of Lal’s findings in 1948 and 1950 (though he carried out a limited digging), the entire site spanning over 562 acres was declared a “centrally protected monument” in 1950. One would have expected a horizontal digging to reveal the magnificent city, which is supposed to have a grand palace or a Buddhist chaitya at the centre. Tell-tale signs of this palace/chaitya exist in the form of 16 stone pillars of more than 4 m high, three of which have fallen and disappeared in recent times. More so also because in the 1950s only a handful of houses existed at the site (the exact number is not available but Lal says “not many villagers lived there at the time”). Apparently, the Archaeological Survey of India (ASI) faced a fund crunch and neither carried out the digging nor acquired the site. The job of excavation was outsourced to the team of Prof Mohanty and Prof Smith more than 50 years later. Lal had predicted (after digging one of entry points and some other areas) that further digging “will reveal a town-plan based on a criss-cross pattern of streets”. This indeed turned out to be so and more. The existence of a pillared hall at the centre of the ancient city (Lal suspected it to be a grand palace but Prof Smith is more inclined to think it was a Buddhist chaitya) was confirmed. Now that a better picture of the city has emerged and has attracted a lot of international attention, the ASI is planning to jump in. The trouble is, by the time fresh diggings start, the site may have disappeared altogether, save for the rampart which has been spared by the land sharks. A visit to the site presents a shocking state of affairs. Most parts of the 562- acre site have disappeared. Thousands of residential quarters have come up and more construction activities are going on at a fervent speed. According to the local ASI officials, nearly 5,000 pucca houses have come up in the past six to eight years. In fact, even as Prof Mohanty and Prof Smith carried out their digging, the construction activity picked up. They were alarmed and approached whoever they could – senior government functionaries, politicians, media persons and even builders – but nobody listened. Prof Yule records in his paper how construction activities were flourishing during this time. When Governance Now visited the site in late 2010 and again in late 2011, new houses were threatening to completely wipe out the last traces of Sisupalgarh. Many of these had come up within a few metres of the central pillared structure. The only untouched parts were the dug-up sites – one entrance, part of residential quarters, central pillared hall and the rampart. The rest have disappeared. Prof Yule was as much anguished then as he is now. He wrote in his email to Governance Now: “It is a shame that even after the ASI granted the greatest distinction to Sisupalgarh, well-healed and greedy developers now misuse on a daily basis. Lack of action on part of the government emboldens encroachers to degrade with impunity the common national and world heritage. I have never heard of the ASI really dealing firmly with encroachers. But this is exactly what is needed. They will never correct their behaviour. It would be a shame if Sisupalgarh would be devastated the same way as Jaugada fortress (160 km southwest of Bhubaneswar). Later generations will wonder why the officials remained passive in the face of encroachment. Sisupalgarh was only lent, not given to our generation.” Lal said he was “pained” at the gross negligence of the ASI and the state and union governments. He said he wrote letters to the ASI and also recorded his criticism wherever and whenever he could but these elicited no response from the officials. Stringent law makes no difference - Construction activities have continued despite the Ancient Monuments and Archaeological Sites and Remains Act of 1958 having stringent provisions, which the union keeps reminding the states from time to time. The law provides for complete protection and preservation of notified monuments/sites, power to acquire land and prevent and punish encroachers. Not only the site, amendments made in the 1990s and later completely banned any construction in a radius of 100 m of such a site and declared a further 100 m a ‘regulated zone’ where the union government’s permission is required for any construction. The law provides for demolition of any construction and recovering the cost of the demolition from the violators. What’s more, a state government order expressly bans all construction activities and sale and registration of land in Sisupalgarh. But even after 5,000-plus constructions, not a single FIR has been lodged. Complete callousness - When Governance Now asked ASI’s station head in Bhubaneswar, AK Patel, for an explanation, he said: “We are dependent on the state government for law and order. We have had several meeting (with various authorities starting) from the very top (meaning chief minister Naveen Patnaik) to the bottom (local officials). But nothing materialized.” When asked if his department had filed any FIR against the violators in the past decade, he could name none. When an explanation was sought from ASI director-general Gautam Sengupta, in Delhi, it was worse. He not only expressed a complete ignorance about Sisupalgarh, he also indicated that he would visit the site and promised to give a “written” answer (“for the benefit of Governance Now”, he said). Several reminders and more than one-and-half months later, when the answers came, he conveniently put the blame on the state government (see the detailed answer at the end). As for the state government, repeated attempts to get their side of the story hit a wall. The local civic bodies said they had no jurisdiction over the area. The only other department dealing with land matters, the general administration department, refused to answer the questions. Finally, it was revealed by those in the know that right from local politicians to senior bureaucrats and other influential people have bought land in Sisupalgarh and have built houses. It is a risky business, since there is an official ban on such activities and it is a centrally protected site. Thus, only those who have access to the power corridors venture out. The historic site will, like the historic city itself, be a thing of the past. But there is a contrast. Back in 4th century AD or thereabout when the city declined and met its eventual death, people shifted out of the area. Why did they shift out of Sisupalgarh? Prof Mohanty and Prof Smith have this to say in their excavation report: “The revised chronology for the site supports a scenario of a shift in population rather than a catastrophic decline due to a political failure or natural disaster. 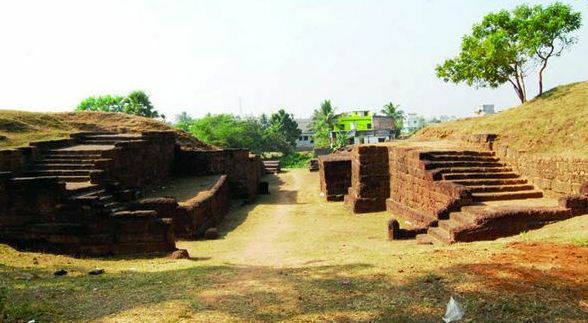 Within 2 km of Sisupalgarh’s ramparts stands the old temple-town portion of Bhubaneswar, whose earliest temples date to the first part of the 7th century AD (Panigrahi 1981:28). As this new construction came up, it appears likely that over the course of several generations people moved towards the area of Old Town and dispersed to the surrounding countryside as well. In this manner, the habitation patterns of the concentrated urban centre were transformed into a landscape marked by temple towns and dispersed rural villages.” We will lose the city now to a reverse phenomenon. ASI’s reply - It may be stated here that Sisupalgarh, an ancient fortified settlement near Bhubaneswar has been declared protected monument vide notification dated 13. 11. 1950. The protected limits of the monument include an area of 562.681 acres under revenue jurisdiction of five villages namely – Sisupal, Badadhanpur, Lingapur, Raghunathpur and Mahabhoisasan. The ownership of the area is vested with Gram Panchayat and private individuals and mainly used for agricultural purposes. This is a customary practice as provided under law to declare any monument/site as protected to be of national importance irrespective of its ownership. The Sisupalgarh was also declared protected but the ownership of its land has never been vested with the ASI. The site was not much affected till its land use remained as agriculture. However, later on the land use was converted into “Ghara Badi” by the Government of Odisha, which resulted in large scale construction of houses at the site. ASI raised concern against the construction activities inside the area of the monument. The Bhubaneswar Development Authority was requested in the year 1995 not to allow any new construction within the monument area. The issue was taken up with the various state government authorities like chief secretary, revenue secretary, secretary culture, BDA, collector of Khurda, etc. to check construction activities at the site. The alarming situation was brought to the notice of the chief minister of Odisha, who instructed BDA, collector Khurda and other authorities to take stringent steps for stopping new construction at the site. ASI lodged FIRs in local police station from time to time and higher police authorities were requested to intervene and stop illegal construction activities to save the site. No data is readily available to tell the exact number of houses which were in existence in the year 1951 and at present. The monuments of state of Odisha were also looked after by the then Eastern Circle, Calcutta prior to the setting up of new Circle at Bhubaneswar in the year 1985, which was created with a view to manage the monuments of the Odisha in a better way and tackle local problems more effectively. However, in spite of that the ASI could not keep proper check on unauthorised construction activities at Sisupalgarh partly due to inadequate manpower, lack of legal instrument and other factors and partly due to its location near Bhubaneswar city. ASI had to always depend on state law enforcing agencies like police, district magistrate, revenue officials, development authority, etc. Archaeology being the concurrent subject under the Constitution of India both centre and state have to play their effective role in keeping the monuments preserved in their proper shape for posterity. As regard tourism infrastructure like proper connectivity, etc it is the responsibility of the State Department of Tourism. It is not true that the ASI has not cared to put signage at the site. In fact many attempts were made in the past but yielded no tangible results as those signage were uprooted by the local residents the very next day they were installed. This is not a policy of the ASI to excavate and lay bare the entire site like Sisupalgarh in one go. Systematic excavation of a segment is sufficient to unearth the important features of the city layout, its architecture, history, social, economic and cultural significance, etc. The rest of the site is preserved for posterity to be excavated in future with advance technology to gather additional information. Since the excavation is also considered to be a destruction of site as such only limited portion of the site as necessary is taken up for excavation. After the excavation of the site by the ASI under the direction of Prof B B Lal, it has recently been excavated by Prof. Ravi Mohanthy, Deccan College Pune in collaboration with Dr. Monica Smith, Cotsen Institute of Archaeology, Department of Anthropology, Los Angeles (USA). Besides, this year the Bhubaneswar Circle has started excavating the site.